Place all the marinade ingredients in a bowl and mix. Add chicken pieces, mix well and allow to marinate for an hour or two. For a party, you can prepare a day before and keep in the fridge overnight. For the batter, place all the ingredients in a bowl and add enough water to make a batter of dropping consistency. Beat well. 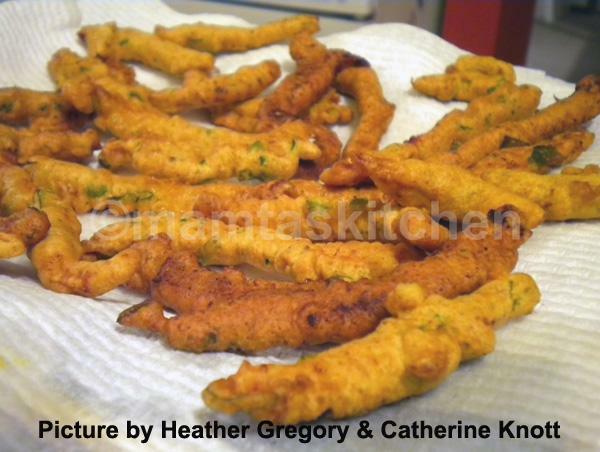 Trapped air in the batter makes pakoras lighter and crisper. Batter should not be made too far in advance, or you will loose the 'lightness' of trapped air. Heat oil in a wok or karahi. Oil is hot enough when a pakora dropped into the oil sizzles and rises to the top. Cooking in very hot oil will make the batter burn quickly, without cooking the chicken thoroughly. Uncooked chicken is dangerous to eat. Cooking in oil not hot enough will make it absorb too much oil and it will be leathery, not crisp. Dip chicken pieces one by one in the pakora batter and slide gently into the oil from the side of the wok, taking care not to splash the oil. Deep fry on medium heat, until golden brown. Lift out with a slotted spoon and place on kitchen paper or old newspaper, to help absorb the surplus oil. Serve with Green Mango Chutney or any other chutney/sauce of choice. You can serve chicken pakoras as a main course, along with Peas Pulao Rice or with a Salad and Naans. *If making pakoras from chicken drumsticks (legs) or thighs with bones, cook the marinated chicken on its own first, until almost cooked, and then make pakoras with batter.